As per the latest information, India's first Satellite Communication Gateway will be established by BSNL as DoT has given the initial nod to earmark $8 million to state run PSU. In order to regulate satellite communication from the country, Government has decided to establish a satellite communication gateway in India. As we reported in November 2014, the state run PSU Bharat Sanchar Nigam Limited will be launching Satellite Telecom Services in India in association with UK based 'INMARSAT'. Currently, satellite telecom services in India are provided by international operators without an earth station in the country. The proposal to build a GMPCS (Global Mobile Personal Communication by Satellite) gateway in the country will enable the rollout of full-fledged satellite-based communication services by BSNL in partnership with the UK based INMARSAT (International Mobile Satellite Organisation). 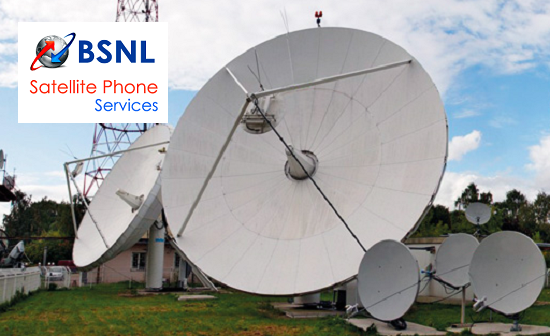 BSNL has already been granted a ‘sui generis’ licence for the provision of satellite-based telecom services on the recommendation of the sector regulator, the Telecom Regulatory Authority of India (TRAI), conditional to the satellite gateway being located within India. While BSNL has estimated that Rs 52 crore will be required towards the cost of the gateway, the DoT has given ‘in principle’ approval to provide support of $8 million to BSNL for establishment of the GMPCS gateway in India. - said an Official. In the absence of a gateway in India, law enforcement agencies are not able to monitor calls made from or to the satellite phones being used in India which, according to DoT officials, pose a national security threat. The country is also dependent on foreign gateways for satellite communication services required by security forces and others at the time of disaster response, especially when normal communication systems break down. A satphone enables a subscriber to communicate from any point, irrespective of location, through a hand-held terminal. The proposed gateway will enable global satellite mobile service under the GMPCS licence. As per reports, BSNL already signed the agreement with 'INMARSAT' and the expected completion date of the project is March, 2016.